Call into any coffee shop, café or bakery in Bordeaux and chances are that you’ll see golden canelés on display. Made from brown sugar, flour, butter and egg yolks, these little, caramelised cakes are on the face of it a fairly innocuous sweet treat. 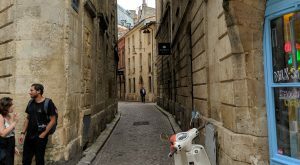 Look behind the scenes, however, and they’re further proof of just how intertwined life in Bordeaux is with the wine industry. Winemakers in Bordeaux traditionally used, and often to this day still do use, egg whites to filter their wines for excess tannins and sediment in a process known as ‘fining’. This, of course, generated a surplus of egg yolks, handily utilised in your mid-morning snack. Chateau Lafite Rothschild still uses in the region of 6,000 eggs per year alone – so the production of canelés makes perfect sense, both economically and gastronomically. This titbit of information, amongst many others, was imparted to us by the inimitable sommelier guiding us during a tour of Chateau Lafite earlier this month. As a guest of the Waddesdon Collection – distributors of the Rothschild Collection within the UK, and one of our favourite suppliers – I was fortunate to get the opportunity to look behind the scenes at Lafite, Mouton Rothschild and Chateau Clarke. We flew into Bordeaux late on a Tuesday evening, just in time to catch England’s nail-biting penalty shootout victory over a rambunctious Colombia in the World Cup – curiously enough, in a hotel bar full to the brim of passionate Colombians. After a warm welcome from our Waddesdon hosts, Helen and Stephen, and a couple of glasses of Baron de Brane 2011 (the second wine of Brane-Cantenac in Margaux, from a less celebrated but very drinkable vintage), we were off to bed with an early start ahead of us the following day. 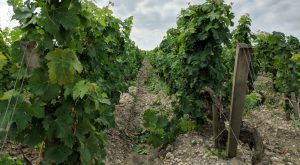 Out in the vineyard, the pebbly, gravel-rich makeup of the soil was striking – one often hears talk of ‘terroir’, but to see and feel the conditions in the flesh here in Pauillac was to understand why soil and climate are such crucial influencers on wine style. Vines here are trained low to catch as much residual heat from the ground as possible to ensure full ripeness of the Cabernet Sauvignon that makes up the vast majority of the Lafite blend (usually in excess of 80%) and are immaculate in their maintenance. Our next stop was down the road in Listrac-Medoc, at Chateau Clarke. After the impressive grandeur of Lafite, Clarke felt refreshingly homely – not a phrase often used for estates in the Medoc! Indeed, the arm of the Rothschild family that own Clarke often use the property as their country bolthole and the feel of the estate, with its lush gardens and airy rooms, is extremely welcoming. After tasting our way through the range, which encompasses both Chateau Clarke and Chateau Malmaison, and is unusually Merlot-heavy for a left-bank property (usually 70%+ Merlot, made in a much softer and rounded style designed to be drunk younger), we sat down to a simply superb lunch backed by wines from the property and also the Rothschild’s far-flung ventures in Chile, New Zealand and beyond. We were also fortunate enough to be joined by Clarke’s winemaker, who rather took a grilling from the assorted wine geeks around the table and was probably extremely glad to shoot off back to his cellar after lunch. Reluctantly parting from the Brie de Meaux that rounded off the meal, we then trooped off to the third stop of the day – Mouton Rothschild. Although Mouton shares the Rothschild name with Lafite, it is very much its’ own beast when it comes to style and ethos. 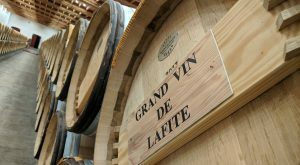 Where Lafite can be visited by invitation only, Mouton opens its doors to regular tours and tastings. Lafite’s labels are elegant and traditional in style, whilst Mouton’s are famed for featuring a piece of artwork commissioned specifically for each vintage from a different artist every year. 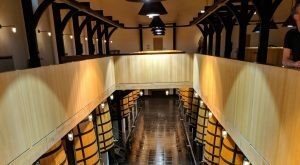 Even the fixtures and fittings inside the winery itself are markedly different in style. One of the particular highlights from Mouton was exploring the private art collection housed within the Chateau, including some truly remarkable pieces as well as the originals from all of Mouton’s label designs from artists such as Picasso, Miro, Kandinsky and Hockney. 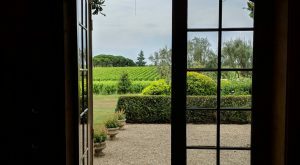 We rounded off the visit to Mouton with a tasting of the latest vintage (2017) from the estate, as well as its two sister properties at Clerc Milon and D’Armailhac. Whilst being little more than en primeur age, the Mouton ’17 (released under a month previously at c.£360 a bottle) was already almost approachable with an incredibly fresh, mineral nose. Grippy with tannins of course given the age, but already starting to integrate and showing glimpses of the wine that it may become. Tasting such a young wine always reiterates to me the skill that those who taste en primeur must have to make qualitative judgements on still un-finished wines. After winding our way back to Bordeaux, mentally digesting all that we had seen and tasted, we finished the day with a hearty dinner in the centre of the city. 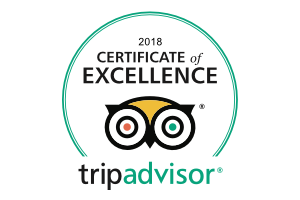 Needless to say, plenty more wine was sampled – including some fantastic white Bordeaux, a wine that often does not get the popularity that it deserves and of which I am a big fan (keep your eyes peeled from an appearance on our next list perhaps..). 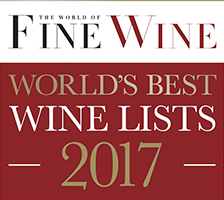 Around the table a lively debate on the direction of Bordeaux’s wines and the relative merits of the en primeur system took hold, but with all agreeing on one thing – the quality of the wines produced is by far and away the most important element. In that respect, Bordeaux goes from strength to strength. The next day was spent exploring Bordeaux on foot – it’s a fantastic city in itself, very walkable with a beautiful old centre and plenty of great views out over the Gironde – before finally heading back to London, fully sated and immersed in la vie Bordelaise.